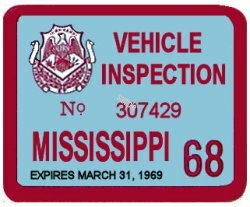 1968 Mississippi Inspection Sticker - $20.00 : Bob Hoyts Classic Inspection Stickers, Add a Final Touch to your Restoration! This is 1968 Mississippi INSPECTION sticker is a perfectly restored reproduction of an original. Mississippi issued the sticker in 1968 and it expired in 1969 during the month listed at the bottom. For an additional $10.00 buyer can order your license plate number to appear at the top where the NO. appears. The back has space to put owner identification. For an additional $5.00 buyer can order specific month you desire at the bottom of the sticker.